Lara, 18, is a senior at Lowell High School, where almost half the 3,200 students are low-income. He is trim with close-cropped hair and a wide flash of a smile. Along with being a National Honor Society student, squeezing in five business electives into an already packed course load, he works 30 to 35 hours a week at his job sorting in-store advertisements at Target. His main goal: getting out of his hometown and into a top-tier college. Amber envisions a comfortable future that includes a family, a modern-yet-rustic house and a good job, maybe as a business owner. Her distaste for school may put her dreams out of reach, but it would take more than a boost in motivation to change the tide. On the surface, American high schools are educating better than ever. Eighty-four percent of students are graduating on time — an all-time high, according to the U.S. Department of Education — and 70 percent are enrolling in college directly after high school. And yet, beneath these optimistic benchmarks lies a career- and job-readiness picture that may be increasingly out of sync with what the future economy will require. I think where high schools have gotten it wrong, or let's be honest, those of us in the policy world have gotten it wrong, is in thinking that high schools’ only job is preparing kids for a four-year liberal arts degree. Critics say high schools aren’t doing enough to prepare young people for life after graduation, in-demand jobs and a pathway to the middle class. Underscoring the criticism are sobering statistics: Nationally, just 25 percent of high school seniors are able to do grade-level math and just 37 percent score proficient in reading. Those numbers are egregiously lower among African-American and Hispanic students. And while 93 percent of middle school students say they plan to attend college, only 26 percent go on to graduate from college within six years of enrolling. These indicators, coupled with the staggering cost of higher education and millions of unfilled jobs in skilled trades, are pushing policymakers to rethink America’s bachelor’s-or-bust mentality. At Lowell High School, educators are scrambling to prepare kids for the future, while acknowledging its fundamental unknowability. When The Hechinger Report surveyed nearly 1,000 Lowell High School juniors and seniors this winter to gauge their feelings about their job- and career-readiness, close to 70 percent said they felt well-prepared to succeed in college and careers; nearly 80 percent said they felt confident that they’d acquired the digital skills necessary to thrive after high school. But a national survey indicates this optimism may be misplaced: Just 16 percent of college instructors rated incoming students as “well” or “very well” prepared for college-level work, according to the 2015 study by ACT, the creators of the standardized college entrance exam. At Lowell High School, students generally have strong performance on academic assessments and high graduation rates overall, but the school has a significant achievement gap: Academic performance and graduation rates for low-income, special education and English language learners — the high-needs students who make up nearly 60 percent of the school's population — are alarmingly lagging. For Amber, college is dead-last on her to-do list. There is one part of her school day, however, that continues to stand out from the blur of required classes and tests she endures in order to graduate: “Culinary is most likely the best part of my day,” she says. In her first year at Lowell High, Amber, like all freshman here, got to pick one or more courses from the school’s Pathways Programs. She chose Culinary Arts and never deviated from the program all four years. Lowell High School’s amped-up program goes a step beyond typical enrichment offerings, with coursework intended to prepare kids for continuing education and jobs in local and state industries that are actively hiring and projected to grow. Pathways — which include multiple classes organized under umbrella sectors such as engineering, health and bioscience, business, environmental sustainability and culinary arts — is extremely popular at the school. Last year, 463 of the 645 students who graduated accrued 10 or more Pathway credits, earning a special designation on their transcripts, a sort of postsecondary résumé-builder. Although the goal is to get kids into college or other postsecondary education, students can also become certified in a specific skill, enabling them to be job-ready by graduation. Amber, whose parents moved here from Laos before she was born, always loved food and cooking. At home, she likes to cook stir-fries and feu (Lao beef stew), and recently learned how to prepare a papaya salad, based on a recipe from her mother and grandmother. Her eyes light up when she speaks about the food she loves. But turn the subject back to school, and she crosses her arms and her face becomes guarded once more. The Lowell culinary program ultimately became a disappointment. “I’m fine with the behind-the-scenes part of culinary, I still like cooking, it’s still fun. But dealing with people and customer service, that’s just not my thing,” she says. Amber is far from alone as she faces finishing high school with plans for her future derailed and no clear path to college. A 2016 Gallup poll of students found that just 34 percent of 12th-graders across America feel engaged in school and only 44 percent of 11th-graders report feeling excited about the future. Engagement and optimism about the future are directly linked to making plans for life after high school — such as attending college or starting a business. Though the mere mention of college depresses her, Amber knows she will eventually need more education after high school. Workers with bachelor’s degrees now outnumber workers with high-school diplomas, according to a report by the Georgetown University Center on Education and the Workforce. Even when hiring workers without a bachelor's degree, employers still look for more than a high school diploma, increasingly favoring those who have an associate degree or some college training. American high schools need to do more to educate young people about careers that require two-year degrees or certifications, rather than primarily promoting expensive bachelor’s degrees, say some experts. Are U.S. students ready for a changing job market? Some educators hope that a push to upgrade career-and-technical programs will engage more students in learning and prepare them for the in-demand jobs and flexibility the future will require. Massachusetts, for example, is investing $45 million over three years to expand and improve career-and-technical schools, making the programs more responsive to the changing job market, and refashioning them as a path not just to jobs but also to two- and four-year colleges. Nationally, there’s some evidence that such efforts are working. All 50 states and the District of Columbia report higher graduation rates for students who take career-and-technical classes than for other students. Evan Caverly is one of Lowell High School's college-bound seniors — and he is stressed out. On the night of the show choir’s first (and only) full dress rehearsal with the school’s pit band, the musicians are far from ready. “Let’s just say it’s still kind of rocky,” says Evan, 17, the student director of Sound Impressions, the show choir group. The day after this rehearsal, the choir is slated to participate in the Lowell Mill City Show Choir Festival, a competition hosted by the school that draws show choir groups from surrounding high schools and involves prizes and feedback from a panel of judges. Though he is nervous, Evan is clearly in his element: He has lived and breathed show choir since he first toured Lowell High School with his eighth-grade class. “As soon as I heard about show choir here, I was like: ‘I love it,’” he recalls. Evan dreams of becoming a music teacher. He was accepted as an early-decision applicant into the music studies program at the University of Massachusetts Lowell, which offers a direct pathway to a master’s degree in music education and a teaching license. Though Evan will likely qualify for financial aid from UMass Lowell, the annual in-state tuition, minus room and board, is $12,496 — relatively affordable compared to the cost of private college, but not for a family that occasionally visits a food bank to fill the fridge. In spite of UMass Lowell’s relative affordability, it is nevertheless his fallback school. His dream school is Elmhurst College, a private liberal arts school in Elmhurst, Illinois, a Chicago suburb. “The more I looked into Elmhurst, the more I fell in love with it,” Evan said. He was admitted in December and visited Elmhurst for an audition in January. The private college of his dreams costs $47,121 a year — a staggering amount for any teenager. Still, he eagerly awaits his financial aid package from Elmhurst, convinced this is his ticket out of poverty. "Fingers-crossed," he texts in early February. can-educating-kids-about-unions-prepare-them-for-the-future-of-workCan educating kids about unions prepare them for the future of work? Evan’s classmate Ben Lara hopes to attend the University of Minnesota. His application got out the door on time despite the fact that Ben’s early-dawn efforts to file his federal financial aid form were thwarted when his mother created her own login and password — and then promptly forgot both. At Ben’s repeated urging, and because the aid form requires parental consent for dependents, she eventually created a second username and password. These too, she lost. Frustrated, but not surprised by how befuddled the application process became, Ben eventually printed out the application, got his mother to sign it, and — delayed by several weeks — submitted it by snail mail. Ben is counting on that aid. The University of Minnesota costs $30,514 per year, not including room and board. 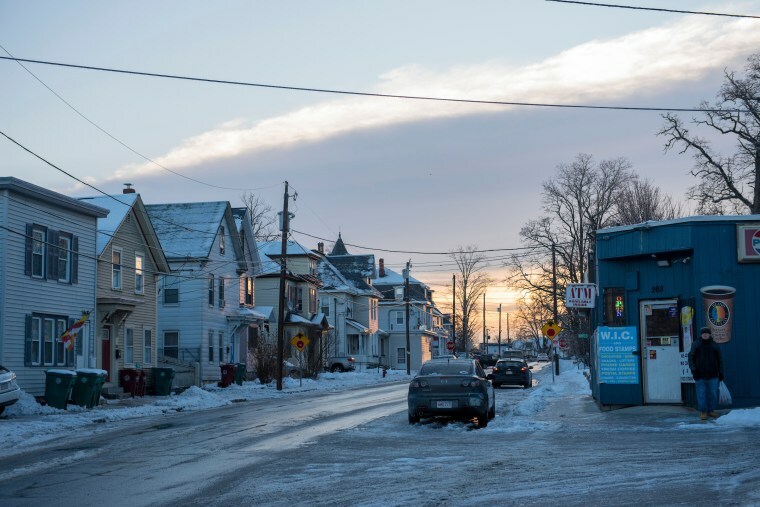 Ben has his heart set on it because, while it ranks high among public colleges, it is also far from Lowell and the complex home life he wishes to escape. He has already been accepted at St. John’s University in Queens, New York, but even with an academic scholarship, grants and other aid, he expects he’ll need to borrow $30,000 a year to attend — an untenable debt load. Without a parent able to help plan his next steps, Ben relied on a combination of college rankings, cost, distance from home and feedback from teachers to develop his college plan. In the face of something like automation, the people-facing jobs are the ones that are going to stay. So we urgently need to equip young people with those skills — critical thinking, problem-solving and communication. No matter which college he attends, he will join the rising number of students forced to take on heavy debt. By the end of 2017, Americans owed $1.38 trillion in student loans. Among young adults with bachelor’s degrees, 53 percent have student debt. And yet, according to the Pew Research Center, only 27 percent of young college graduates with student loans say they live comfortably and about half say the lifetime financial benefit of a college degree outweighs the cost. Over a lifetime, a dual-headed household with bachelor’s degrees and $53,000 in college debt loses $208,000 in lifetime wealth — nearly four times the amount borrowed, according to a 2013 brief by Demos, a left-leaning policy organization. Contributing to this debt crisis, some policymakers argue, is that so little information exists for students like Evan and Ben on which colleges — and majors — offer a strong return on investment. Legislation in Congress that proponents say would help high schoolers discern which programs would pay off in the long run has stalled. Moureen Mathenge, a junior at Lowell High School who moved here last year from her native Kenya to live with her mother, has a plan. She is already selecting colleges and the courses and degrees she’ll need to step up to a better life. Moureen and her older sister lived with grandparents and cousins in Kenya for 10 years while her mother sent home money she earned as a caretaker at a Lowell nursing home. “My mother moved here to work, so that we could get a better education and have a better life,” she said. In many ways, Moureen is a typical teen: often on her phone, pushing her mother to loosen the protective reins and starry-eyed about leaving home to travel the world. At the same time, she is also a composed 15-year-old, with a 4.5 GPA, who speaks Swahili, Kikuyu and British-inflected English. For now, as she bides her time until senior year when she can start applying to colleges, she is working on getting her footing in Lowell. Mary Githinji, Moureen's mother, was drawn to Lowell in part because of its large Kenyan population. Indeed, diversity is in the city's DNA. In the early 1800s, Irish, Portuguese, Polish and French-Canadian workers — willing to fill the lower-paying factory jobs that had previously been held by Yankee women — powered the textile mills that made Lowell an industrial hub. After many of the city’s mills shut down prior to World War II, the city’s population declined but its reputation as an immigrant-friendly city survived, according to “Lowell: The Story of an Industrial City.” Its largest immigrant populations today come from Cambodia, Laos and South America. Githinji's move here in 2007, after winning a green card via lottery, was emotionally and logistically difficult. Within two months of arriving, Githinji earned a nurse assistant certificate and found work at a nursing home, where she is still employed today. Githinji’s goal is to go back to school for a nursing degree. But with one daughter now studying medicine in China and Moureen headed to college soon, her dreams may have to wait. Because Githinji works in the booming health care sector, which is expected to add 2.4 million jobs overall in the next decade as baby boomers age, her future should be financially stable. However, unless she is able to save enough money to earn a degree, she will likely remain stuck in a low-wage job, an increasingly familiar trap for many Americans. The average salary for a health aide is $22,600, making it a job that barely qualifies as middle class. Githinji's median wage as a registered nurse would increase to a much more favorable $68,450. With policymakers across America debating how to best prepare young people for the good jobs of the next decade and beyond, educators like Lowell High School's McLeod are pushing students to learn soft skills as the best means for surviving in the workforce that lies ahead. Signal Success, a curriculum that helps teens develop essential work skills such as how to take feedback and work out conflicts with colleagues, is integrated into a number of the Pathways Programs. Some states — and individual high schools — are also trying to break down the walls between classrooms and industry. Colorado, for example, is pushing apprenticeships for students while they are still in high school, giving them an opportunity to earn money while gathering skills in fields such as IT, insurance and banking. Lowell High School provides workplace learning opportunities for students as an integral part of some Pathways. But, bridging the gap between the school's teenagers and the workplace needs of local businesses has been difficult — this year just 39 students are in internships. In the Hechinger survey of juniors and seniors, more than 70 percent said they wished their high school had done more to connect them with real-life work opportunities. Ben is still waiting to hear from his top choice, the University of Minnesota. His unwavering career goal: business owner. What type of business? Any type, he says, as long as it’s lucrative. Amber, who in December declared a hatred of school so intense she could not stomach the idea of higher education, now says she's planning to attend college. This reversal stems, perhaps, from repeated badgering by teachers who felt panicked about her lack of plans. Despite Amber’s change of heart about a culinary career, Lowell High School still made an impact on her prospects: She stayed in high school and made plans for life after graduation. She’ll probably enroll at nearby Middlesex Community College, she says, but not until 2019, or maybe 2020. “I don’t want to go, but I want the option in case I change my mind,” she said. In February, Amber began her first after-school job, earning $11 an hour as an aide at Community Teamwork, a local after-school program for elementary and middle school children. In a turn of events that has perhaps surprised Amber most of all, she loves her new job. Hedging her bets, she says one thing is for sure: "I won't be doing this for the long run."